Doors, blinds, window shutters etc. perform the basic function of covering the window or door opening, maintaining privacy, keeping the noise out and keeping the cold or the blistering sun out. Roller shutters are a stylish variation of traditional doors or window shutters. These are available in various colors and materials and there are a wide range of roller shutters to choose from. Roller shutters can be used for any vertical or horizontal opening. They are suitable for windows, storage spaces, office or home furniture and storage etc. For instance, you can use roller shutters for a cabinet in your bathroom or kitchen and give it a modern and yet a functional look as these rolling shutters take up less space. You can also use them in your entertainment center to keep your music systems or TV safe form damage and dust when not in use. The roller shutter profile can be made of PVC, aluminum, wood or even glass. A good roller shutter shields you against the harsh sun rays in hot summer months and prevents discoloration of your indoor furniture and upholstery in sun rays. The same shutter can be simply pulled up to let in more light and warm rays of the sun during the cold summer months. Different styles of shutters allow you to choose perforated sheet or small slits type rolling shutters which allow some light to pass through even when they are pulled down. Shutters can also be used with insulation to keep the heat in and the cold out thus minimizing the loss of energy in cold winter months and keep your heating costs down. These also effectively keep the noise out and prevent the inner noise from going out. Sturdy roller shutter also keep your homes and offices safe providing protection against break in. Choose the color matching your interiors from the wide range of roller shutters. Colors can also be chosen to match your building’s exterior. Even the guide rails and end slats can be painted in the color you desire. A good roller shutter should be of sturdy construction, able to retain its shape and functionality despite repeated uses. It should be resistant to scratching, staining or cracking. Aluminum roller shutters should be resistant to corrosion as well. Roller shutters can be hand operated for small shutters. For larger shutters, motor operated control systems are used. Now you can roll up or down the shutter from mere press of a button on wall or on a remote. Latest models include features such as automatic timer operation, light and heat sensing units wherein the shutters open or close on sensing particular temperature or light levels in the room. Rain and wind sensors allow the shutters to close in case of rain or heavy wind. You will no longer need to worry about running across your home for closing the windows or worry that the rain or storm might have ruined your office in your absence. 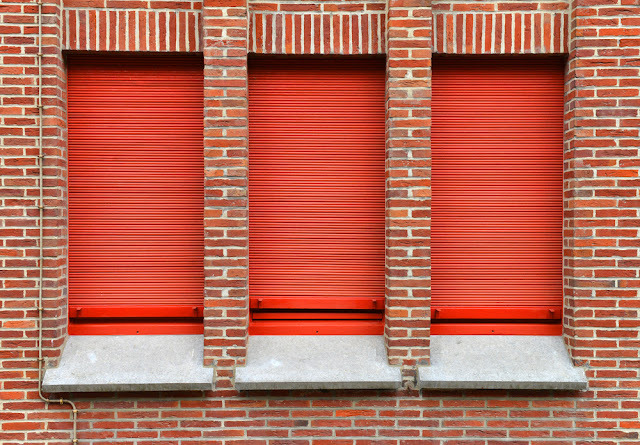 Apart from lending a colorful look to your windows, good quality roller shutters are also an effective break in protection. Rolling shutters installed on doors in offices, shops or commercial places serve this purpose as well. Wide range of roller shutters available in the market makes it easy to choose the ones suiting your requirement. Whether you want them to match your interior décor while working as an effective window blind, or want protection against noise and good insulation or want the roller shutters as an effective protection against break in for your shop or office, roller shutters fulfill any and all of the above expectations. Moreover, you can search on the internet and choose the roller shutters which one you need. Nicely written blog. I really appreciate your hard work. We are also working with widow shutters.